I was reflecting the other day on war, trying to recall if there has ever been a time in my lifetime where we, as a nation, have not been at war or participating in a war somewhere on the planet. Some of the wars were referred to as conflicts, but they really were wars. I think of Korea and Vietnam. What got me to thinking about all of this was a leadership seminar sponsored by The National Museum of the Pacific War here in Fredericksburg, Texas. Our company, Cloudtippers, is a business partner and one of the perks is this yearly seminar. The speaker was a U.S. Marine officer, Donovan Campbell, who served two tours in Iraq and one in Afghanistan. 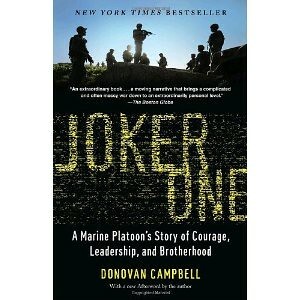 His book, Joker One: A Marine Platoon’s Story of Courage, Leadership, and Brotherhood, put him on the radar of the museum foundation’s CEO, General, USMC (Retired) Michael Hagee, former Commandant of the Marines. The chatter as we were making the rounds before the start of the program was Have you read the book? Of course, I had not. I had recently finished Unbroken: A World War II Story of Survival, Resilience, and Redemption chronicling Louis Zamperini’s amazing experience. (Zamperini is another Foundation sponsored event here in May. Not bad for a rural town!) I sort of needed a break from that kind of intensity. But the few people who had read the book, all mentioned that, while they don’t usually read that type of book, found they were captivated and were so glad they had read it. Hmm. Maybe I would reconsider IF our library had the book. The program started and we were all captivated by Donovan Campbell. It wasn’t the intensity of war stories as much as it was the revelations of leadership and lessons learned alongside a group of young men in the worst of battle situations in Ramadi, 2003 and 2004. He wrote the book, part of his Harvard MBA program, as a way for his platoon to relate their experiences once they returned home. The book served as a spring board for a broader talk on leadership. Most of us have no idea of the impossible situation these 18, 19, 20 year-olds are faced with as they perform their daily duties in an urban war, under harsh environmental conditions (130-degree temperatures, no running water and no electricity), without adequate equipment (like working radios or enough armored vehicles). Campbell’s ability to frame the context for the rest of us and articulate principles that can be incorporated into real life a part from war, was inspiring. Surprisingly, our library does have the book. It is definitely worth the read! Campbell is a captivating storyteller, but that’s not the main reason to read the book. The main reason to read the book to is better understand why we need to make sure we, as a nation, provide whatever services are needed for those returning from war. They volunteer to do the work and make sacrifices none of the rest of us can or will do. Whether we agree with the decision or not to get involved in this, or any, war, is beside the point. As citizens of this nations, we all share in the responsibility.